CABLE HIGHLIGHTS: FX’s AMERICAN HORROR STORY: HOTEL started strongly, as that series tends to do (it slumps later, although still delivering big numbers), down 0.12 from last fall’s premiere to 2.99. TBS’s telecast of the MLB WILDCARD GAME was at 2.59, up 0.25 from the previous night’s game on ESPN, while the NHL season began on NBC Sports Net at 0.40. MTV again aired TEEN MOM on Wednesday, down a tenth from last week to 0.67, and followed by ARE YOU THE ONE, which was up 0.13 to 0.39. 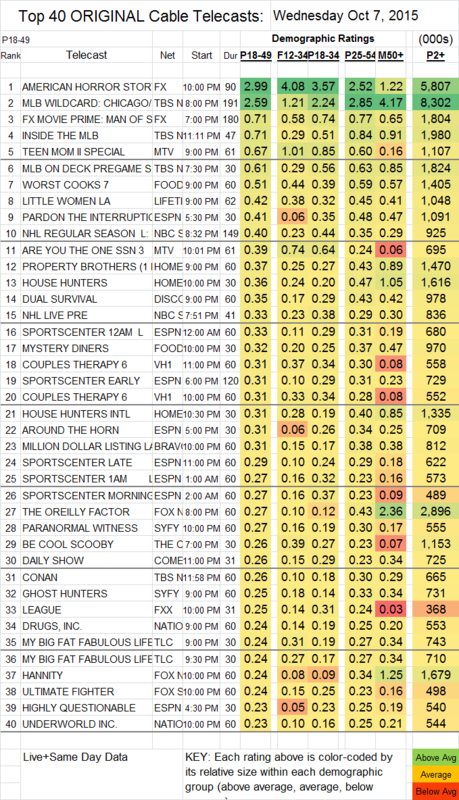 Food Network’s WORST COOKS fell 0.08 to 0.51, and MYSTERY DINERS was at 0.32. Lifetime’s LITTLE WOMEN LA climbed 0.06 to 0.42. On Discovery, DUAL SURVIVAL fell 0.23 to 0.35. 2 episodes of VH1’s COUPLES THERAPY were both at 0.31. 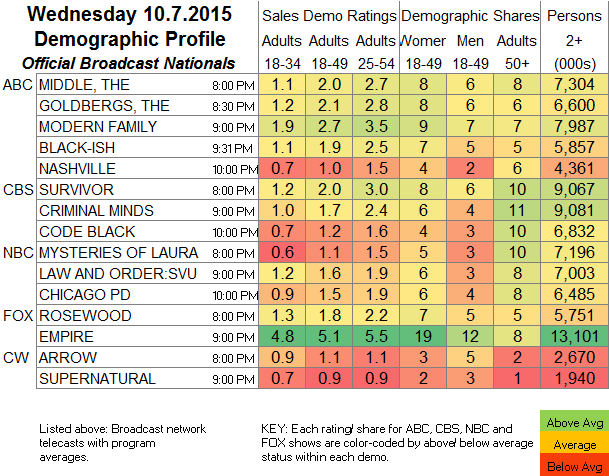 Bravo’s MILLION DOLLAR LISTING edged up 0.02 to 0.31. On Syfy, PARANORMAL WITNESS lost a tick to 0.27, and GHOST HUNTERS fell 0.11 to 0.25. THE DAILY SHOW WITH TREVOR NOAH still hasn’t found its level for Comedy Central, dropping 0.12 from Tuesday to 0.26. On FXX, THE LEAGUE lost 0.14 to 0.25, and YOU’RE THE WORST dropped 0.03 to 0.12. The premiere of JAY LENO’S GARAGE on CNBC was at 0.12. On ABCFamily, KEVIN FROM WORK aired without a YOUNG & HUNGRY lead-in, and lost more than half its rating, down 0.08 to 0.06 with 149K total viewers and then 0.05/120K for a 2d episode. On DAM, IMPACT WRESTLING was up 0.01 at 9PM with 335K total viewers, adding 0.03/112K at midnight, while RING OF HONOR was also up 0.01 to 0.05, with 175K total viewers.